Almost two years after first being notified about the problem by environmental advocates, federal health officials this week confirmed dangerously high levels of formaldehyde in travel trailers and mobile homes occupied by people displaced by Hurricane Katrina -- levels expected to rise with temperatures. Consequently, the Federal Emergency Management Agency said it would take "aggressive action" to move people out of manufactured housing and into more permanent homes by summer, or at least into hotels and motels until more long-term solutions are found. In a Feb. 14 press conference held in New Orleans with FEMA Administrator R. David Paulison, Centers for Disease Control and Prevention Director Dr. Julie Gerberding discussed the preliminary findings of her agency's study of formaldehyde in housing for Katrina victims. The chemical, which is emitted by building materials, has been linked to breathing problems and cancer. One-third of the 519 travel trailers and mobile homes the CDC tested had formaldehyde levels high enough to cause respiratory symptoms in children, the elderly and people with respiratory diseases such as asthma. Both housing types were found to have high levels -- on average, about five times the levels in most modern homes. About 5 percent of the units had levels so high that even people without vulnerabilities could experience breathing problems. Though the majority of units tested had relatively low levels of the chemical that would not be expected to cause health problems over the short term, Gerberding acknowledged that "exposures do add up over time" and that even residents of units with low levels of formaldehyde were at risk of health problems over time. FEMA and CDC staff are in the Gulf region to meet with study participants and advise them on the findings, and the agencies will hold community meetings to provide information to Katrina trailer dwellers who were not chosen to participate in the federal study. FEMA will offer caseworker assistance to help affected families find new housing alternatives, and the agency will provide financial assistance with food, furniture and boarding of pets for families in need. The CDC is also creating a registry of people who lived in manufactured housing after Katrina in order to study their health over time and gain a better understanding of formaldehyde's impacts. However, neither CDC nor FEMA have any programs in place to help trailer and mobile home residents with medical expenses incurred as a result of living in unsafe housing. 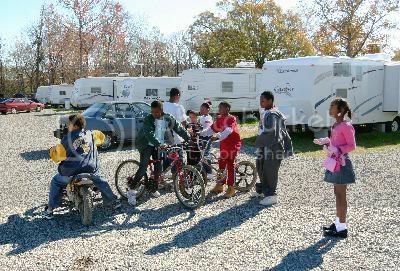 At the peak of the Katrina-related displacement, about 144,000 families were living in trailers, with an average of about three residents per trailer, according to Paulison. About 38,000 families are still living in those units, and about 30,000 of those are parked next to private residences that are being renovated or rebuilt. FEMA reports that about 800 to 1,000 displaced families are moving out of manufactured housing each week. Because the Katrina disaster wiped out a significant portion of the region's affordable rental housing stock, FEMA has faced difficulties in getting displaced renters into permanent housing. To address this problem, Paulison announced plans to create a joint federal-state relocation task force to help improve placement efforts. He could not provide any figures on how much the relocation effort would cost. When asked about how the agency would deal with families that chose not to leave their travel trailer or mobile homes, Paulison said that would be an issue for the joint housing task force to address. "That's going to a tough decision for us," he said. "Some people aren't going to want to move." In response to concerns about mobile homes originally designated for Katrina victims being used to house families left homeless by the recent tornadoes in Arkansas and Tennessee, Paulison said his agency would allow the use only of those units that had been aired out for at least a week and that had been tested and found to have low formaldehyde levels. Furthermore, he said FEMA would not use use travel trailers to house disaster victims in the future. But he didn't offer any plans to provide additional testing on units as the weather warms up and formaldehyde off-gassing increases. CDC is now doing further work to identify those manufacturers whose units tested especially high. Gerberding said that analysis would be available in a few weeks. But she cautioned against using the results for Katrina units to make judgments about manufactured housing more generally. "We learned something about mobile homes and need to step back and see what relevance this has," she said, adding that manufacturers have taken steps over the years to lessen formaldehyde off-gassing. Neither Paulison nor Gerberding mentioned the Sierra Club, which first discovered high formaldehyde levels in the manufactured housing FEMA provided to Katrina victims. Findings released by the environmental advocacy group in the spring of 2006 found that 88 percent of trailers tested had formaldehyde levels above the federal recommended limit. But it wasn't until heated congressional hearings held last July that FEMA leaders agreed to work with the CDC to conduct their own study of trailer air quality. As a result, some advocates have suggested that the agencies intentionally delayed the tests until cooler weather arrived, bringing down formaldehyde levels. There are a steps that people still living in FEMA trailer and mobile homes can take to minimize formaldehyde levels, according to Gerberding. These include ventilating the units, spending more time outside, and not smoking tobacco inside, which worsens formaldehyde pollution and also makes people more susceptible to respiratory problems. Trailer and mobile home dwellers experiencing respiratory symptoms should contact their doctor. Residents can call toll-free 800-CDC-INFO for more on health effects and 866-562-2381 for FEMA relocation assistance. Gerberding hopes that by next Valentine's Day she will be in the Gulf to celebrate the placement of all Katrina-displaced families in permanent housing -- because, as she said, "home is really where the heart is."